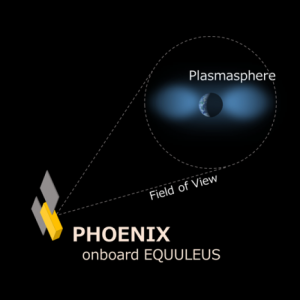 A small telescope in extreme ultraviolet named PHOENIX will be boarded on EQUULEUS. It consists of multilayer-coated entrance mirror (diameter of 60 mm) and photon counting device (microchannel plate and resistive anode encoder), and electronics parts. The reflectivity of the mirror is optimized for the emission line of helium ion (wavelength of 30.4 nm) which is the important component of the Earth’s plasmasphere. The Earth’s plasmasphere is the region where dense plasma from the ionosphere is captured along the closed magnetic field lines. In the plasmasphere, it is known that various phenomena are caused by the electromagnetic disturbances in the solar wind. Helium ions are the second major component in the plasmasphere (almost 10% of the total amount), and resonantly scatter the solar EUV emission at the wavelength of 30.4 nm. By flying far from the Earth, PHOENIX provides the whole image of the Earth’s plasmasphere understanding the spatial/temporal evolution of plasmasphere.